Let's say little Ernie wants to go trick-or-treating as a skeleton pirate. And Cynthia wants to go as a circus puppy (where did that come from?). Then there's your ten-year-old Boris who wants to go as a banana. So you've got an assortment. But there's no need to flip through our makeup catalogs just because you don't have an easy-peasy trio of zombies. 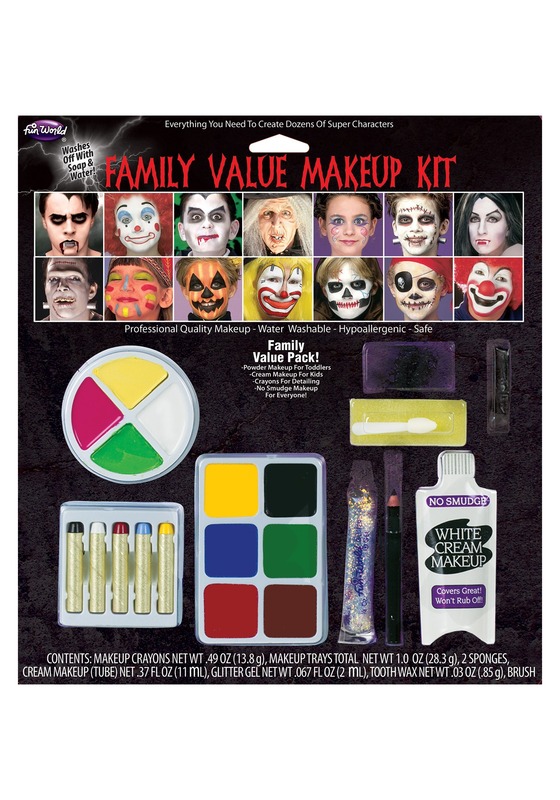 You'll have colors to create all of your characters with this family value makeup kit. When it comes to creating a variety of looks, this kit has it all. You'll get two palettes of a variety of colors that also has an applicator. You'll get color sticks to make detailed lines, liquid white makeup to make up the base, a black liner pencil, and a tube of multi-colored glitter. And when your child wants to transform from their monster self back into a kid, you can simply wash this makeup off with water. If you're ready to own Halloween, you'll need a variety of makeup to work with. After all your kid might want to be a unicorn one day and turn into an alligator the next. You'll love digging into this kit and watching all your kid's disguises level up. Who knew it was so easy to become a Halloween hero? This costume is perfect and well put together.